As a spinner, I hated cotton for many years. When I failed at being able to immediately spin a usable strand from it, I rationalized that it was a beastly fiber not worthy of my time and trouble. 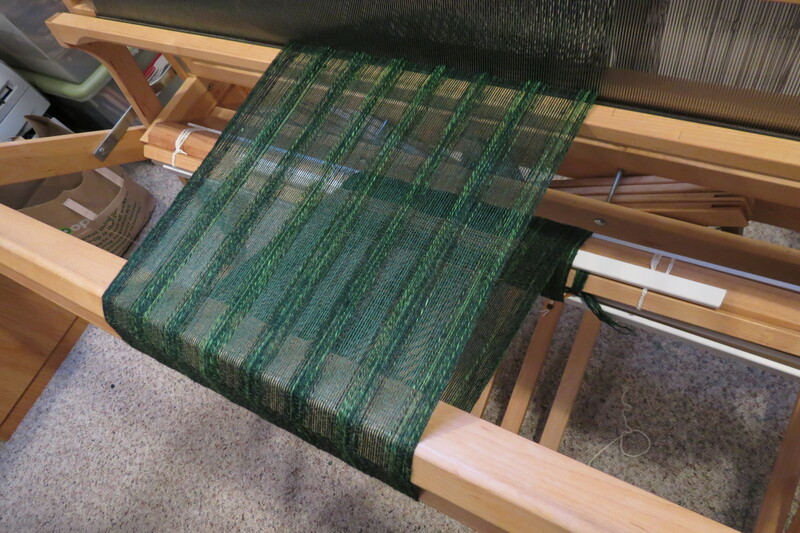 What I didn’t realize was that ordinary spinning wheels aren’t designed to easily handle such short, fine fibers. My Ashford Traveller has a lace-weight high-speed flyer that handles wool, alpaca and silk with no trouble, but even so, I can’t spin cotton easily on it. Learning to spin cotton required a complete reassessment of all my spinning techniques. Basically, if you want to learn to spin cotton, you won’t easily do it using a conventional spinning wheel. Different tools are necessary. 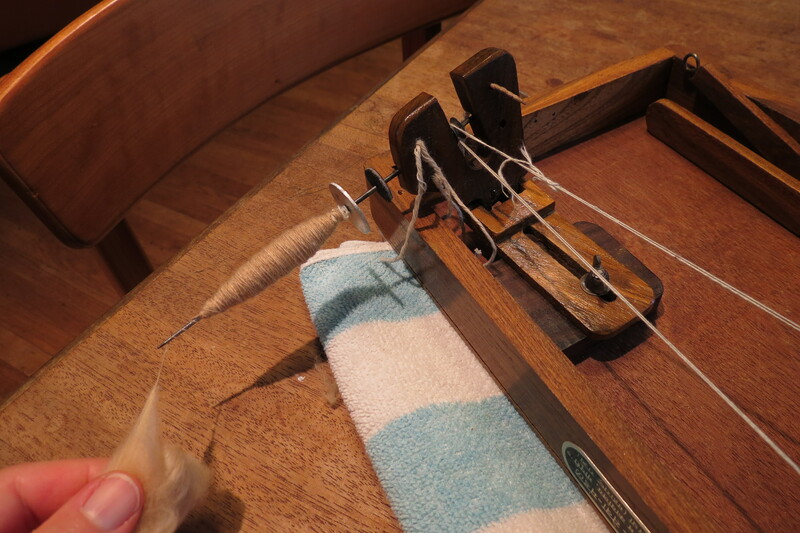 Ignore the wheel and use a lightweight support spindle instead (the lighter the spindle, the more delicate the thread that you can spin with it). 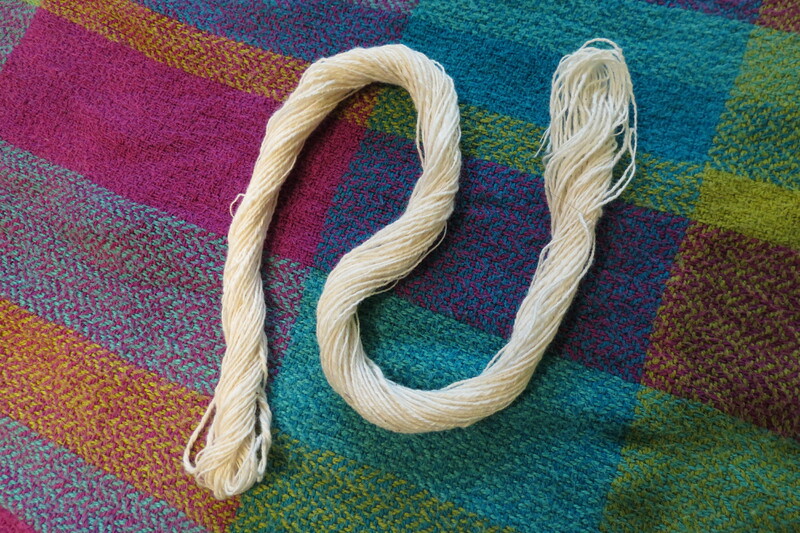 This photo shows my first successful triple ply made from spindle-spun singles that were then Navajo-plied on my wheel. (Wheels are excellent for plying cotton; but they generally don’t have a high enough ratio most of the time to spin the singles.) Click this photo to enlarge. Even so, using a spindle was not easy. It took probably six hours or more of practice, and lots of lumpy thick thread was thrown out during the process. I had no handy reference videos to refer to. And yet, my six-plus hours of practice taught me several things. First, don’t grip the roving. Cotton wants to be held delicately, as you might hold a butterfly or a baby bird. Cotton sliver also absorbs moisture from hands and will clump badly, so the lighter your grip, the better. Gentle drafting, allowing the cotton to pull itself out of the roving in your hand, creates a most delicate thread. Secondly, pay attention! 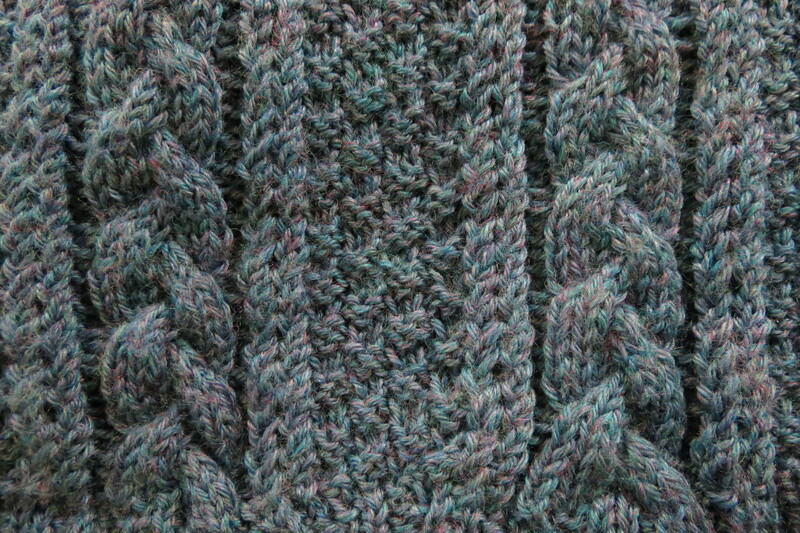 Cotton is not as easy to draft as other fibers, so you mustn’t slip into a daydream. Thirdly, add extra spin at the end of each armful you spin. You need lots of twist if you intend to ply, for plying will remove much of the twist from your singles. It’s better to be moderately overspun than underspun, because you don’t want to watch all your careful work float apart as soon as you complete it. I initially disliked the Indian brass takhli that came with the Cotton Clouds Learn-To-Spin-Cotton kit. 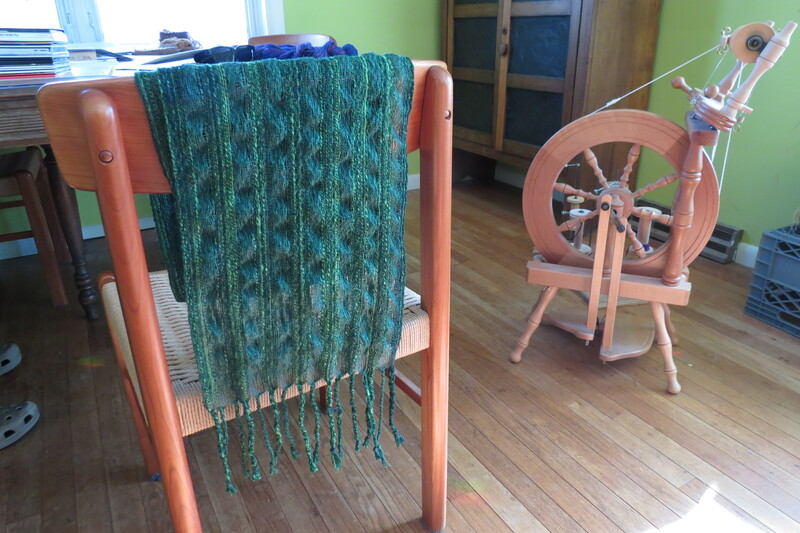 The finish flaked off the central shaft beneath my fingers, the hook at the top seemed needless and slightly unbalanced the spin, and overall, the small spindle felt several inches too short for my hand. But it spins forever, and it also spins on unlikely surfaces such as a blue-jeans-clad leg, Formica countertops, and auto upholstery. The exquisite spin helps you create a truly fine thread, as you will see if you click to enlarge. I now love and respect the takhli and would never part with it. A traditional book charkha can be folded up and takes about the same space as a book on a shelf. The two accelerated wheels at right turn the spindle, at left. At first, the Indian charkha seemed squirrelly and rickety, particularly when easing the drive bands on and off. But although I almost despaired at the beginning, several hours of practice improved my drafting style. 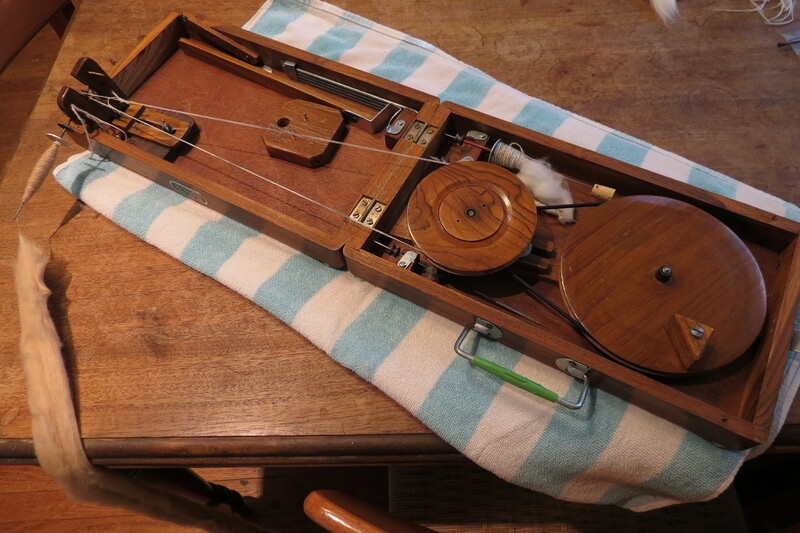 Today for the first time, after four or five hours of practice, I can finally spin as well upon the charkha as I can upon the takhli spindle. 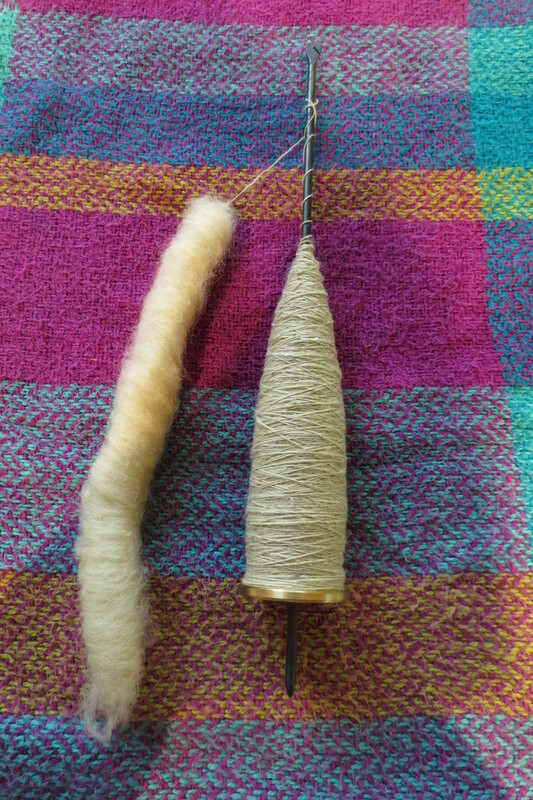 Click to enlarge and see the fine thread on the spindle. Even though I initially disliked or didn’t quite “get” the takhli and the charkha, both of them turned out to be exquisitely designed to spin the finest thread. So if you intend to explore cotton spinning on your own, just make sure you supply yourself with either of these vitally necessary spinning tools.